The Fort Sanders Regional Gamma Knife Center at Thompson Cancer Survival Center features the newest and most-advanced Leksell Gamma Knife Perfexion, a stereotactic radiosurgical procedure used to treat brain tumors and other disorders. The Gamma Knife Center houses the first advanced system in Tennessee, one of only 30 in the United States and the newest tool to treat brain disease, including those conditions previously considered inoperable. The Gamma Knife Perfexion offers patients an alternative to traditional surgeries which sometimes involves additional risks and complications from incision. Instead, the Gamma Knife Perfexion offers a non-invasive, two to four hour procedure that often allows the patient to leave the center the same day. Advanced. The Gamma Knife Perfexion, a non-invasive radiosurgical tool, delivers sophisticated treatment plans in significantly less time, expands treatment capabilities to cover a wider range of indications, and provides automated functions requiring little involvement by the patient. Efficient. Gamma Knife is an alternative or supplemental treatment to traditional brain surgery. The procedure typically is performed in a single outpatient treatment session with considerably reduced treatment times and minimized surgical complications. Precise. 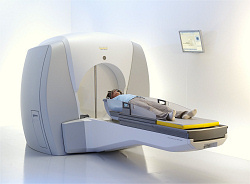 Gamma Knife is used to precisely target brain tumors and disorders with finely-focused radiation beams that minimize damage of healthy brain tissue.